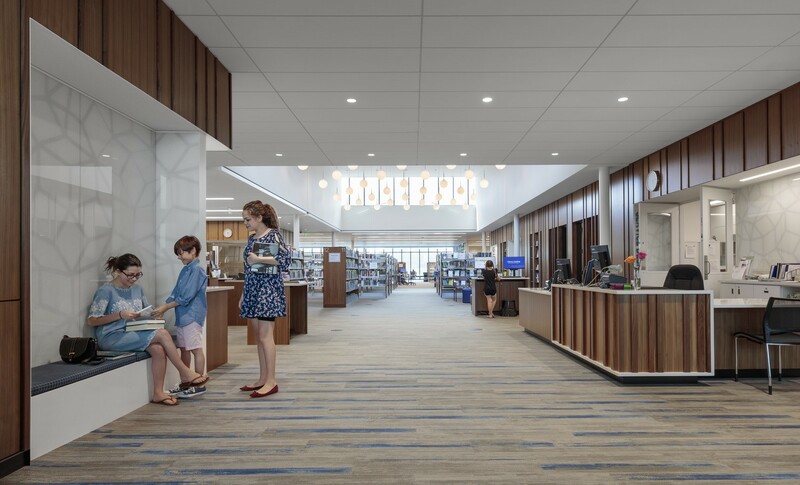 Ramsey County Library-Shoreview (MN), designed by HGA, has won a First Place ASHRAE Technology Award for outstanding achievement in the design and operation of energy-efficient buildings in the Public Assembly-New category. Located in Shoreview northeast of Minneapolis/St. Paul, the 34,028 square-foot, multi-functional branch library includes book stacks, computer area, teen and children’s sections, multiple study rooms, a marketplace, large community room, Ramsey County Library system-wide administrative offices, and Ramsey County technology services area. Achieve 70 percent reduction in energy usage compared to a baseline building. Design for flexibility to meet changing future programs. The design and engineering team exceeded goals through integrated solutions that include underfloor air distribution, high-efficiency air-cooled chillers, controls tailored to occupant usage in concert with the building envelope, passive solar control, and 100 percent LED lighting. Energy-efficient planning resulted in 70 percent reduction in energy usage, 41 percent reduction in water usages, and 44 percent reduction in carbon output. ASHRAE is the professional membership association of the American Society of Heating, Refrigerating and Air-Conditioning Engineers. Award winners will be highlighted at the 2019 ASHRAE Winter Conference & AHR Expo, January 12 to 16 in Atlanta.